Piccolo Diavolo is an Italian restaurant and pizzeria situated in the heart of a Soho, serving an extensive range of Italian cuisine at reasonable prices. Catering for upto 60 people, Piccolo Diavolo is the ideal venue for small parties or pre & after theatre dinner. The restaurant is popular and buzy with a friendly and welcoming ambience. 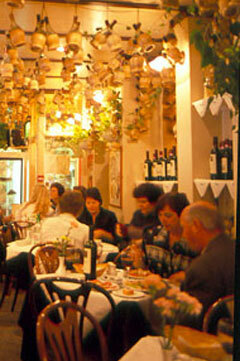 The decor is attractive and Chianti bottles hang from the ceiling giving this restaurant an authentic Italian feel. It's a perfect environment for a leisurely business lunch, romantic dinner or family night out. Due to its central location this restaurant is perfect for pre and post theatre dining. Being a family oriented restaurant, children are welcome. Service is relaxed and friendly. Featuring traditional Italian food and warm service, Piccolo Diavolo can cater for private and business parties, birthdays and get-togethers of up to 55 guests. Guests get to choose from the a la carte or set menu. The main influence on the restaurant menu is Italy in all its glory - there's a comprehensive range of freshly prepared cuisine from soups and pizza�s to veal and grill dishes. There are daily specials and a good choice of vegetarian options. The wine list consists of a healthy selection of specially selected Italian wines to accompany your meal.